The annual National Marine Mammal Peer Review Committee met in St. John’s, Newfoundland last month. The goal of this Department of Fisheries and Oceans scientific committee is to generate science advisory reports on issues regarding populations of marine mammals in Canada. One of the populations reviewed this year was the St. Lawrence Estuary (SLE) beluga (Delphinaterus leucas). To do so different scientists working with this population, including Stéphane Lair, the CCWHC – Quebec Regional director, presented results of research programs on the ongoing monitoring of the health of this population. 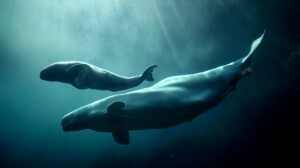 The SLE beluga are listed as threatened under Canada’s Species at Risk Act. A review of the SLE beluga status (2007) concluded that the population was stable over the period 1988-2006. However, in recent years there has been an increase in reports of death of young-of-the-year, and an apparent increase in adult female perinatal (the period immediately before and after birth) mortalities, suggesting that the status of SLE beluga may have changed. Unusually high numbers of newborn calves were documented in 2008, 2010, and 2012. The age composition of the carcasses indicates an increase in the mortality of young adult females during the 2000’s compared to the 1990’s. Even if there is no significant long-term trend in abundance, the estimates of abundance of the SLE beluga population realized in 2009 were the lowest estimates generated for this population. The proportion of 0-1 year-old calves counted during photographic surveys has declined from 15.1-17.8% in the 1990’s to 3.2-8.4% in the 2000’s. An age-structured population model estimates that the population was stable or increasing at a slow rate until the early 2000’s (reaching approximately 1000 individuals in 2002), and has declined since then to a total population of 889 individuals in 2012. Necropsies conducted on 222 carcasses indicate that the primary cause of death for juvenile beluga was parasitic pneumonia (52%). Cancer (17%) and bacterial diseases (13%) were the most common causes of death in adult beluga. Cancer was not observed in beluga estimated to be born after 1971, which coincides with the regulation of several chemical substances, including polycyclic aromatic hydrocarbons (PAHs). Necropsies also show the occurrence of problematic births (dystocias) and post-partum complications. These reproductive issues were associated with the death of 19% of adult females examined, and they have increased in frequency over the past decade. SLE beluga are one of the world’s most contaminated marine mammals. While some chemical substances (e.g., PCBs, DDTs) have decreased in beluga over the past decade, others such as the polybrominated diethyl ethers (PBDEs) compounds, increased exponentially during the 1990s, and are at their maxima since then. Their role in the recent elevated frequency of complications at parturition and mortalities of newborns in SLE beluga could not be determined. However, these different classes of chemical substances are known to have various endocrine disrupting effects in mammals, with possible impacts on reproduction, immune system and behaviour, and on offspring development. SLE beluga are chronically exposed to noise and disturbance due to commercial shipping, recreational activities, and an extensive marine mammal observation industry. Vessel traffic related to tourism and recreational activities peak in July-August when SLE beluga give birth, and has increased between 2003 and 2012 in some sectors of their Critical Habitat as a result of newly established whale-watching companies operating in the Upper SLE and targeting beluga. The analysis of 28 ecosystem indices describing ecosystem variability of the Gulf of St. Lawrence from 1990 to 2012 indicates that environmental conditions shifted from periods of above, to below long-term averages in the late 1990’s, i.e., approximately at the same period as when SLE beluga population shifted from a stable to an unstable age structure, to lower proportion of calves in the population, and increased number of dead calf reports. The period of below long-term average environmental conditions was when large demersal fish and spring herring were at their lowest numbers, ice conditions were below-average, and water temperature above-average. The evolution of these variables since 1971 also identified the period starting in the late 1990s as a sustained 14-y long period when conditions were below long-term average, with unprecedented extreme conditions in 2010 to 2012. The above-average numbers of dead calves in the SLE in 2010 and 2012 occurred during an unprecedented period of well-below long-term average ice conditions in the Gulf of St. Lawrence and for 2012, high water temperatures. The National Marine Mammal Peer Review Committee concluded that several indicators are suggesting that this population is facing a decrease likely consecutive to a reduction of calf survival. Although the events that initially triggered this disruption are not fully understood, the problem seems to have worsened in the last six years. The results of this review suggest that SLE beluga live in an environment that is less favorable than Arctic environments since the late 1990s, also characterized by chronic exposure to potentially aggravating stressors such as marine traffic, persistent organic pollutants, and occasional toxic algal blooms. It is recommended to continue the monitoring the SLE beluga population dynamics, as well as trends in habitat quality, including environmental conditions, prey abundance, and current and emerging natural and anthropogenic stressors. There is also a need to further our understanding of the ecological needs of beluga, and the mechanisms of action and relative importance of current environmental stressors in order to implement actions that are the most appropriate to help recovery of this population.